In the end of last year, while the eyes of Yemenis were on the still unfinished power transfer following from the deal brokered by the Gulf Cooperation Council, a curious event took place in Spain about which little was heard in the Middle East: “Casa Árabe” (Arabian House), an international institute on Arabic and Islamic studies in Madrid and Cordoba, held a series of conferences called “The Arab Springs in Evolution”, in which different experts analyzed the evolution of political changes in the Middle East. It was particularly interesting that the title itself pointed to the fact that Arab Spring is not only one but many different springs and that the world “evolution” was used, echoing the words of Eugen Rosenstock-Huessy from 1963: “Revolution and Evolution are but two parts of the same process. You cannot have one without the other.” As it is always the case with expert analysis on the Middle East, we are already used to the absence or rather passing reference of Yemen and surprisingly this wasn’t the case. On December 14 and 15 an interesting panel on Yemen titled “Yemen: Contestation and Creation. The Revolution Inside” was hosted by Spanish researcher Anahi Alviso-Marino, researcher at the Centre Français d’Archéologie et de Sciences Sociales de Sana’a (CEFAS), who lived in Yemen since 2009 until she was evacuated to Oman in March 2011 in the course of the violent uprising. She has been working on the connection between artistic creativity with social and political activism. In this context, she published an interesting article on art magazine Nafas in April 2011, dealing with social change in Yemen as seen through the work of Yemeni artist Amna Al Nassiri and her installation “Hisarat”, presented in Sana’a in February 2010. At the time, Ms. Alviso-Marino argued that the installation, even though it received harsh criticism from the local art scene, would have been seen differently today because it anticipated the way in which people began occupying public space in Sana’a demanding reforms and revolutionary change. In the words of Al Nassiri from 2010 commenting on the crude reception of her work: “They feel the danger of this change, they don’t want changes in art in the same manner that they don’t want changes in their lives, in their societies.” Today obviously it has become clear that the change is wanted and that people are striving for it in spite of great adversity, even though it is clearly dangerous because a revolution implies not only a transition of political systems but a change in the way we live. The reflections of Ms. Alviso-Marino in Spain were poignant on highlighting this with a critical eye: The desire for reform embodied by the Yemeni uprising seems to be somewhat stranded on practical demands of the political kind while the social structure hasn’t been necessarily questioned. This happens to be the case with nearly all of the Middle Eastern uprisings and the consequences are visible already in the difficult transitional politics of Libya, Egypt and Tunisia. However, the case of Yemen stands out – paradoxically – as a case in which the uprising did not create a public space for politics and art for the first time, but rather, seized upon an existing public space and vastly expanded it. Mobilizations took place in the country in 2006 and 2009, a certain freedom of expression existed in a variety of critical media and works of poetry, fiction, painting and photography among others, predated the revolution introducing themes that were not necessarily traditional. Cases in point are of course the work of Al Nassiri, and also that of cartoonist Kamal Sharaf. These pre-existing themes gained nevertheless newer and deeper surfaces in the course of 2011 when they were integrated into innovative elements of contestation and protest. 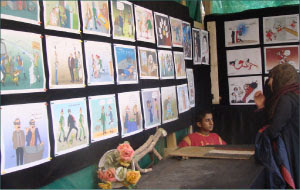 Even though revolutionary art – if such terminology is adequate – sprouted in nearly every country in the region, in Yemen it was a central element of protest with the now famous tent cities, in the form of posters, paintings, drawings, stencils, graffiti and the like, that were used not only by the revolutionary youth but also by the government. Artistic production included not only fine arts but also photography, music – with genres as surprising as hip hop and reggae – and integrated particularly Yemeni icons and themes, as much as iconography from the larger Arab Spring inspired by Tunisia and Egypt. The unique role of art in the uprising was photo-documented in June by Atiaf Alwazir and traveled all over the globe through blogs and other online venues, highlighting the role of online media and the Internet in the revolution. The variety of art works were meant not only as documentation of the historical momentum but offered above all an inflected narrative with a particular message in which taboos – at least political ones – were lifted and opened the way for a wholly new style not only of art but of political and social conversation. Later this narrative was also translated into short documentary films. Overall Ms. Alviso-Marino’s presentation was the most complete documentation to date of the role played by art in the Yemeni uprising under extraordinarily unique circumstances, and even though it is still little known, it is available in Spanish from the Internet. It cannot be underestimated that a great effort was put into action by an unprecedented number of Yemenis that took to the streets not only to demand reforms and rights, but to engage in styles of political conversation that while were not new to them, only now gained dimension in the public space. The recovery of the public space through art is without doubt one of the great achievements of the Yemeni revolution and is grounded in pioneer work done by independent Yemeni artists – at the risk of disapproval and censorship – in the past decades. Small as the artistic production has been, it has set the foundation for a larger and richer zone of freedom that is not exclusively political.